Many times in a conversation about golf courses you will hear these words: Zoysia, Bermuda or Serangoon. Those with interest in landscaping or gardening may have heard of Pearlgrass, Carpetgrass or Taiwangrass. And then there are Cowgrass, Buffalograss and even Lovegrass. These are all common names of common grasses – even if you may not have heard of them. Then there are golf courses who declare their greens are planted with Tifdwarf and yet you can see the grass is different from the Tifdwarf on another golf course. A golf course in Malaysia is reportedly in the process of replanting their greens with Tifeagle. And yet a couple of golf courses say that their newly renovated greens are planted with a hybrid. People often use common names for common grasses. But sometimes these names can be confused for other species. For example, you may find that Carpetgrass in one place could be called with another name in another place. For that reason there are also scientific names for almost every plant known to man. The same plant will be called with the same scientific name all over the world. The scientific name is in Latin, so sometimes it is also called ‘the Latin name’. Each scientific name is made up of a generic name and a specific name. The generic name is the name of the genus to which the plants belong to. The species is the basic unit of classification for a specific group of individual plants. It has a Latin description about the species that makes it different from species of the same genera. The species name sometimes is about what the species may look like, or the name of the person who discovered it or the name of the place of origin or maybe even the common names of the species in the native tongue. Lets take the example of Zoysia matrella and Zoysia japonica. Zoysia is the name of the genus and both matrella and japonica are the name of the species. Notice that both of these species share the same generic name, this shows that they are thought to be more closely related to each other than to any other species of grass. Two additional terms are variety and cultivar. They are often used incorrectly as interchangeable terms, but they have very different meanings. A variety is a group of plants in a natural population that has distinctive features often selected by environmental pressures through sexual reproduction. A variety is usually planted from seeds. A cultivar (or cultivated variety) is a plant selected by man for one or more unique features and is usually planted vegetatively in order to maintain those features. For grasses, this usually means planting from sods, stolons or rhizomes. You may also have heard of the term ‘hybrid’. In general, it means the crosses between populations of cultivars or species. You ‘marry’ one cultivar or species to another and what you get is called a hybrid. Nowhere else is the species of plants more discussed about on a golf course than on the greens. Rightly or wrongly, the reputation of the golf course (and the superintendent) is, to a large extent, judged by the performance of its greens. Golf courses with good greens are more often than not considered as a good golf course and can be assured of high golf traffic. There are other factors of course, but give a decent golfer a choice between a golf course with great fairway and a mediocre green and a golf course with a mediocre fairway and a great green, which one would he/she choose? What makes a green ‘good’ for a golfer? In general it is the speed and trueness of the green. And how does a Superintendent makes a green fast and true? The first and most effective way is to cut the grass to the lowest height possible. Would it be just as easy as that, then anybody can become Superintendent. You see, in the wild, the grasses are usually grown long and tall for the herds of cows and sheep to graze. And so the search for the grass that can be cut at low heights began not long after World War 2. There are other characteristics that are considered for the choice of turf other than height of cut: low maintenance, reduced water requirementsand improved disease resistance are always important characteristics. Some new cultivars are advertised as using very little nitrogen and have lower water requirements. Colour is an important factor too, with dark green being the favourite colour. You wouldn’t want to putt on a purple green now would you? Tifgreen (aka Tifton 328) Bermudagrass. No golf course in Malaysia that I know of admits that their greens are planted with Tifgreen Bermudagrass, yet no article on golf course grass would be complete without a few paragraphs about it. Tifgreen is a sterile hybrid between Cynodon dactylon and Cynodon transvaalensis. It was bred and evaluated at University of Georgia Experiment Station in Tifton. Testing was done on a few golf courses and it was released in 1956. It has an ideal cutting height of 6 to 12 mm (1/4 to 1/2 inches). With the use of growth regulator products, it has been known to be cut at 3mm for very short periods. Hardly the preferred choice of any Superintendents today, almost 50 years ago it was the best grass for a putting green. Contrary to popular belief, Tifgreen is not the first cultivar to be officially released. That title should go to a cultivar named simply U-3 when released by the Agricultural Research Station of the US Dept. of Agriculture in 1947. But Tifgreen is important because Tifdwarf; the most widely used turf on green, is somehow descended from it. Tifdwarf is a cultivar of Tifgreen. It was released in 1965 but its origins can be traced back to 1956 when the experimental Tifgreen was sent to a few golf courses in the US for trials. The Superintendents noticed a few patches of grass that has a lower growth habit than the Tifgreen. The Superintendents isolated those patches and grew them in the nursery. Tifdwarf resembles Tifgreen except that its leaves and internodes are significantly shorter than those of Tifgreen and it has a darker green color. Primarily because of its shorter growth habit, being able to withstand mowing heights as low as 4.5mm, Tifdwarf became the turf of choice for putting greens. Problem is there are Tifdwarf and then there are Tifdwarf. Plenty of people out there claiming the grass in their nursery or greens are Tifdwarf and chances are if you send samples for testing, probably only about half of them would be right. Of the other half, the majority would be Tifgreen, and the rest would be made up of off-types of either Tifgreen or Tifdwarf. Were you to buy Tifdwarf from a few different sources and plant them on a green, you would get a very ‘merry’ multi-hued grass indeed. To explain about the differences in all those Tifdwarfs would require a lesson on genes and chromosomes. I’d have to talk about mutations and off-types, and there’s probably enough material there for one article by itself. In brief; remember I mentioned earlier that Tifdwarf is a cultivar of Tifgreen? It was something in its genes that gave it its special characteristics other than its parents. These ‘special’ plants were then isolated and then propagated as Tifdwarf. This process continues. Superintendents and nursery owners all over the world continue to do the same thing. If the grass on Green 11 is your best, you would take that grass and propagate it in your nursery to plant on your greens. Sometimes there’s not that much difference in the grass characteristics. Sometimes it is so very distinctive that it is recognized as a different cultivar and maybe given a different name. Examples include Quality Dwarf, Classic Dwarf, PF-11, FloraDwarf, and Champion. Remember this process has been going on for over a period of almost 50 years. Very few golf courses in Malaysia import their grass from a nursery that sells turf with a certificate of authenticity. In fact, very few golf courses in Malaysia can trace the lineage of their grass! So that is why a Tifdwarf from one golf course may be different from Tifdwarf on another. It may not be the same ‘Tifdwarf’! Yet at the same time it is still same enough that it is still called Tifdwarf. Confusing isn’t it? In the case of the few golf courses in Malaysia planted with turf that has very different characteristics from the usual Tifdwarf, I believe that they are cultivars of Tifdwarf, since they are picked from Tifdwarf greens and grown in a nursery before being planted back on greens. The question most often asked is; is this Tifdwarf? How do you confirm? Can we do a DNA test? In theory; yes. In practice; tough. You see, Tifdwarf is believed to have arisen naturally by mutation from Tifgreen. And Bermudagrass has thousands of genes, each associated with thousands of DNA subunits, so a mutation affecting only one of those subunits within one gene would be a very small part of the organism’s total DNA. To find that one mutation would be like finding the proverbial needle in the haystack. Another way would be to send samples to test its characters against documented Tifdwarf characters. Growth rate, plant height (uncut after about six weeks or so) internode length, leaf blade size etc. The samples are then calculated to give a statistical probability answer. The Agronomy Department in UPM does provide such a service. Tifeagle is one of the new ‘Ultradwarfs’ or ‘Superdwarf’ to come on the market. It is a mutant engineered by irradiating Tifway II stolons with gamma radiation in 1988. It was evaluated in over 25 golf courses in the US from 1993 to 1997. It is reportedly able to stand a height of cut to as low as 3.2mm! Tifeagle will produce higher quality putting surfaces than Tifdwarf but also requires more intensive management. Research has shown that inadequate maintenance of Tifeagle will result in thatchy and inferior putting surfaces. So a golf course considering Tifeagle should review management practices of the courses that have adopted Tifeagle and determine if the golf course budget, schedules and management will support the required cultural practices. Here is a grass that has been in use a lot but not been researched much. Many older golf courses in Malaysia have this grass on their greens. But it is rare that a new course would choose Serangoon (Digitaria didactyla), though believe it or not, there is very little reason not to. The only reason is probably because not much is known about it, due to the few research and glamour that is associated with the grass. It can be mown to heights of 4.4mm and is common in the tropics and subtropics. It can tolerate short-term flooding but survives seasonal dry condition or drought by shriveling and/or losing all leaf. If more is known about its limits, enemies, mutations and greater prominence is given to it, there may be a chance that the old Serangoon may be the turf for the future of greens in Malaysia; ironic as that statement may be. Only one golf course in Malaysia is known to be planted with this cool-season grass. Up on a hill resort with its high altitude and heavy rainfall, it makes for a cool enough temperature for Bentgrass to survive. There are more than 100 species in the genus of Agrostis, but only four are suitable for golf course greens. The most common is Creeping Bentgrass; Agrostis palustris. Bentgrass can be mowed at a minimum height of 3mm. It is said that there are new cultivars that can be cut to 2mm! Research at Cornell University in the US shows that the green speed can go up to 14 feet at that height. If you are thinking of converting your grass to Bentgrass; bear in mind that with Bentgrass, major problems occur when the air temperature is at 32 degrees or above and the soil temperatures exceed 25 degrees. At that point, the roots and shoots just stop growing. There will be new improvements to existing species of turfgrass for greens. I believe there will also be new species developed for greens. Or perhaps there will be cultivars of species of weeds or even fairway grass for greens. Already there is the variety Sea Isle 2000 from the species Paspalum vaginatum; which can tolerate much higher levels of salt [up to ocean water salt levels, as high as 34,000 parts per million] in the soil and water. Even Zoysiagrass has a variety that is being tested for use on greens. 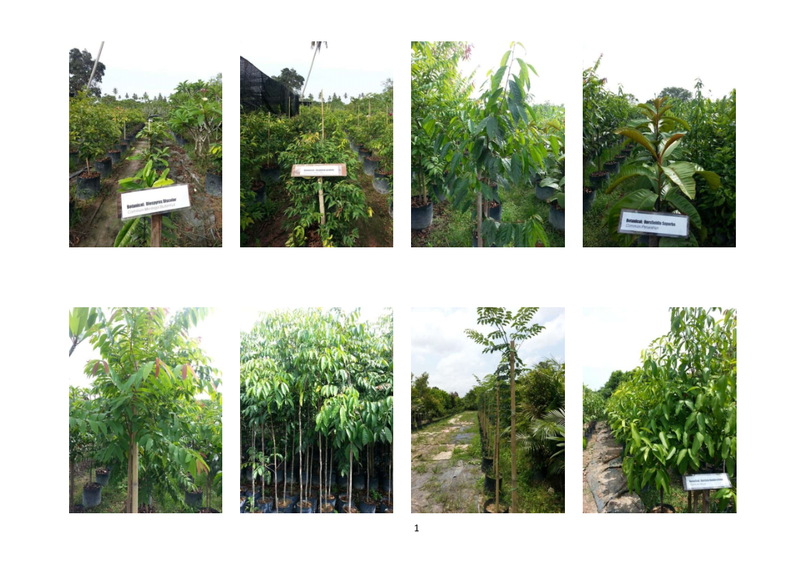 Serangoon too has a few varieties or cultivars to its name. Which grass should your golf course have? That is a decision best discussed with your golf course Superintendent. What works in another golf course may not work in yours, whether due to climatic or soil differences, or even due to the reality of a particular golf course. Let’s face it, you may want to have Tifeagle, but with its high maintenance cost, you may not be able to afford it. Or you would like to have Bentgrass, but with air temperatures sometimes topping 34 degrees Celsius, you wouldn’t have a hope. You think the new Tifdwarf cultivar is good but your irrigation system is spraying out salty water; perhaps you should consider Paspalum? You think the greens on a certain golf course are good and you buy some grass from them, would it work? If the grass is true Tifdwarf with stable genes, chances are you would get the same grass. If not it may mutate into something different or if it was a mutation, it may regress back into the original grass. It may not be bad, it could be better! After all; “Good or bad” says Palpatine, the Dark Lord of the Sith in Star Wars III “is a point of view”. 328 can be maintained at low cutting heights below 3mm all year round. Gailes GC Brisbane is testament to this. Tif – Eagle has been superseded by Mini Verde and has proven that it produces sustainably faster green speeds while having increased stress tolerance due to its deep rooting dense biomass. Serangoon is a deleted factor when it comes to quality putting surfaces.The leaf characteristic alone give way to it not being used.It is a poor choice for any surface that is worthy of being called high quality. Platinum TE Paspalum has become the par choice for Paspalum although I do agree Sea Isle 2000 is an excellent choice if maintained correctly. No soil can tolerate that much salt that is simply incorrect.The Paspalum plant as too the new varieties of Zoysia “Diamond” and “Dynasty” can tolerate high salts but you will find that soil issues like structure problems and nutrient lock up will follow. Bentgrass can be taken as low as 1.8mm. Cutting heights are not the benchmark for green speeds.Cultural practices lay the foundation to ensure that the leaf is standing upright and therefore putting less friction on ball roll amongst other items of practice. I have had greens at 3.5mm faster than greens at 2.8mm simply because of smoothness.Greens speed is incorrectly referred to as speed ( speed is measured distance over time ,Superintendents do not time the ball over a distance) it is however a measure of surface smoothness. Tif Eagle does not have a high maintenance cost. Sulfate fertility along with simple Calcium Nitrate / Potassium Nitrate alternated applications will suffice along with sound cultural practices are not expensive.More expensive than Serangoon agreed but we are not comparing apples to apples when you talk about local grasses.Nor are we talking the same quality putting surfaces either. Thank you for your comments and views. I welcome, value and appreciate all of them; even dissenting or differing ones, especially those with professional views. I am aware that Mini-verde has superseded Tifeagle. When I was managing Glenmarie and was renovating the greens, my first choice was Tifeagle, the then Superintendent Dion convinced me that Mini-verde was a better choice and having heard and seen his points; agreed with him. I must say that I was impressed with the initial performance of Mini-verde but unfortunately left the club just months after the second phase of planting. Anyway, whenever and wherever I was called to consult, I would bring up my experience with Mini Verde. I believe that I wrote the above article before my involvement with Mini verde. It was written for a local golf magazine for ordinary golfers’ leisure reading. I reproduced it here many years after the print. Perhaps ‘saline’ would have been a better choice of description than ‘salty’ but… never mind; you are right. I agree totally about cutting heights not determining greenspeed. I have had countless arguements and discussions about this subject and written numerous articles about it too. One of it was in a Malay-language golf magazine; . Hopefully your point will convince others about this too. As for your other points; noted. And thank you. En. Hassan, I dah reply to your handphone yang you bagi in another posting a few days ago. Since Sime Darby dah tutup their nursery in Sepang there is only one in Malaysia that I know of and he doesn’t selll in quantities for laman rumah. Only for golf courses or football field. Dear sir， is serangoon grass suitable for fairway n where can I buy serangoon grass as seeds in Malaysia? Sir, in my humble opinion, yes it is suitable. Just make sure you have pretty good irrigation system. Two courses have Serangoon fairways: Kinrara in KL and Meru Valley in Ipoh. Go and check them out. The only nursery I know that had Serangoon closed a few years ago. Your best chance is to wait for the clubs that had Serangoon on greens or fairways do dethatching or hollow tining and offer to help them clear their rubbish. where to buy Bent Grass seed in malaysia?